از دهه گذشته تاکنون، شبکه‌های اجتماعی به عنوان یکی از جدیدترین امکانات اینترنت همه‌گیر شده‌اند. ضرورت این پژوهش از آن روست که این شبکه‌ها با استقبال گسترده کاربران رو به رو شده و در حال حاضر تعداد زیادی از این شبکه‌ها فعال هستند. در بین شبکه‌های اجتماعی مجازی، فیس‌بوک از موقعیت متمایزی برخوردارست؛ چراکه در حال حاضر پربازدید‌ترین شبکه اجتماعی دنیا به شمار می‌رود. هدف این پژوهش مشخص کردن رابطه سرمایه اجتماعی در فیس‌بوک با مشارکت مدنی کاربران در دنیای واقعی است. نمونه‌گیری با استفاده از روش‌های هدفمند و گلوله برفی انجام شده و روش پژوهش نیز پیمایش برخط بوده است. ضمن آنکه تعداد 674 نفر به پرسشنامه، پاسخ داده‌اند. بعد از تحلیل داده‌ها مشخص شد بین سرمایه اجتماعی در شبکه‌ اجتماعی فیس‌بوک و مشارکت مدنی در دنیای واقعی رابطه مثبت وجود دارد. همچنین مشخص شد در بین شاخص‌های سرمایه اجتماعی، باز/ بسته بودن شبکه دوستان، تراکم شبکه، شرایط دستیابی به منابع، شکاف بین منابع موجود و مورد انتظار، رعایت هنجارها و قواعد، اعتماد نهادی/ مدنی و هنجارهای کنش متقابل شاخص‌های تبیین‌کننده مشارکت مدنی کاربران هستند. Over the last decade, social networks became ubiquitous as the latest option the Internet provided individuals with. This study is significant because social networks have received public attention and there are many of them right now. Among all virtual social networks, Facebook enjoys a distinguished position, because it is the most widely used social network in the world. This research aims to shed lights on the relationship between social capital in Facebook and users’ civil participation in real world. Purposeful snowball sampling was used to select 674 individuals to take part in the online survey by filling in a questionnaire. The findings indicate that there is a positive significant relationship between social capital in Facebook and users’ civil participation in reality. Furthermore, among social capital indicators, there are six indicators explaining users’ civil participation, i.e. openness/closeness of friends’ network; network’s concentration; conditions for accessing resources; gap between existing and expected resources; observing norms and regulations; institutional/civil trust as well as interactions’ norms. الوانی، مهدی و سید‌نقوی، علی. (1380). سرمایه اجتماعی، مفاهیم و نظریه‌ها. فصلنامه مطالعات مدیریت، 33 و 34. ببی، ارل. (۱۳۸۴). روش‌های پژوهش در علوم اجتماعی (ترجمه رضا فاضل). تهران: سمت. تاجبخش، کیان. (1384). سرمایه اجتماعی، اعتماد، دموکراسی و توسعه (ترجمه افشین خاکباز و حسن پویان). تهران: شیرازه. عاملی، سعید رضا. (1388). پژوهش مجازی. تهران:پژوهشکده مطالعات فرهنگی و اجتماعی. عاملی، سعید رضا. (1389). شبکه‌های علمی مجازی. تهران: پژوهشکده مطالعات فرهنگی و اجتماعی. عبداللهیان، حمید. (1387). پیمایش و نمونه‌گیری روی خط؛ مشکل معرف بودن و راه‌حل‌های آن. مجموعه مقالات اولین سمینار تخصصی نظرسنجی الکترونیکی، تهران: مرکز افکارسنجی دانشجویان ایران. عبداللهیان، حمید و کرمانی، حسین. (1392). مطالعه سرمایه اجتماعی کاربران ایرانی در سایت فیس‌بوک. فصلنامه تحقیقات فرهنگی، 23. فیلد، جان. (1388). سرمایه اجتماعی (ترجمه غلامرضا غفاری و حسین رمضانی). تهران: کویر. کوثری، مسعود. (1386). جهان فرهنگی کاربران ایرانی اورکات. تهران: پژوهشگاه فرهنگ، هنر و ارتباطات. منظور، داوود و یادی‌پور، مهدی. (1387). سرمایه اجتماعی عامل توسعه اجتماعی و اقتصادی. 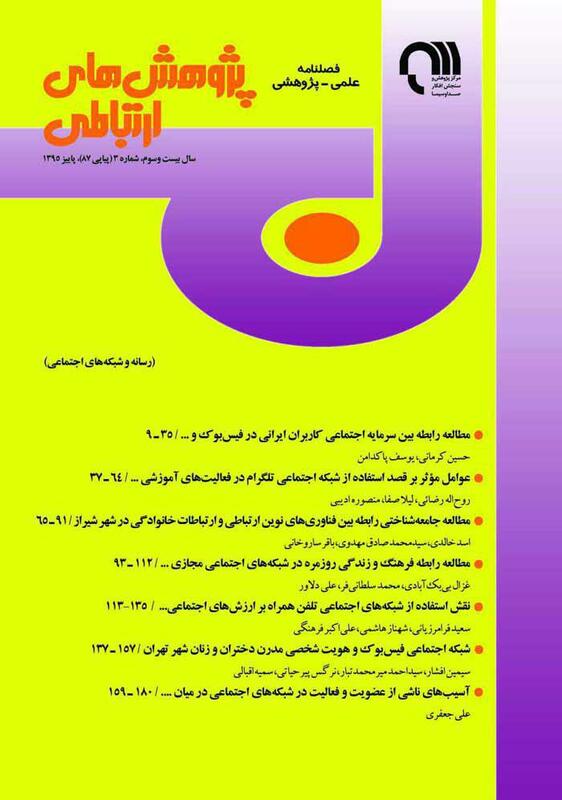 راهبرد یاس، 15. Ackland, R. (2009). Social Network Services as Data Sources and Platforms for E-Researching Social Networks. Social Science Computer Review 27; 481 Riginally published online Mar 30, 2009. DOI: 10.1177/0894439309332291. Adler, R. P. & Goggin, J. (2005). What Do We Mean By 'Civic Engagement ?. Journal of Transformative Education, 3: 236, DOI: 10.1177/1541344605276792. Boulianne, S. (2016). Online News, Civic Awareness, and Engagement in Civic and Political Life, New Media & Society, Vol. 18, No. 9, Pp. 1840-1856. Busselle, R.; Reagan, J.; Pinkleton, B. & Jackson, K. (1999). Factors Affecting Internet use in a saturated-access population. Telematics and Informatics, Vol. 16, Issues 1–2, Pp. 45-58, ISSN: 0736-5853, from, http://www.dx.doi.org/10.1016/S0736-5853(99)00018-0. Chen, Xin. & Siu, Kin Wai Michael. (2015). Smart Communication in the Context of Lifestyle Transformation: A Case Study of Smartphone User Behaviour among Hong Kong’s Young. The International Journal of Interdisciplinary Studies in Communication, Vol. 9. De Zuniga, H. G. & Valenzuela, S. (2010). The Mediating Path to a Stronger Citizenship: Online and Offline Networks, Weak Ties, and Civic Engagement, Communication Research,2011, 38: 397 Originally published online 8 December 2010, DOI: 10.1177/0093650210384984. Ellison, N. B.; Steinfield, C. & Lampe, C. (2007). The Benefits of Facebook "Friends:" Social Capital and College Students' use of online Social Network Sites. Journal of Computer-Mediated Communication, Vol. 12, No. 4, Pp. 1143-1168 from, http://www.jcmc.indiana.edu/vol12/issue4/ellison.html. Farrell, A.; Tayler, C. P. & Tennent, L. (2003). Social Capital and Early Childhood Education. Perspectives on Educational Leadership, Vol. 13, No.7. Franke, S. (2005). Measurement of Social Capital, Reference Document for Public Policy Research, Development, and Evaluation. Toronto: Canada. Gonzalez-Bailon, S.; Borge-Holthoefer, J.; Rivero, A. & Moreno, Y. (2011). The Dynamics of Protest Recruitment Through an Online Network. Scientific Reports, 1, 197. DOI: 10.1038/srep00197. Hampton, K. N.; Sessions, G.L. ; Rainie, L. & Purcell, K. (2011). Social Networking Sites and Our Lives: How People’s Trust, Personal Relationships, and Civic and Political Involvement are Connected to Their Use of Social Networking Sites and other Technologies. Pew Internet & American Life Project. Hanifan, L. J. (1920). The Community Center, Boston: Silver Burdett. Harlow, S. (2012). Social Media and Social Movements: Facebook and an online Guatemalan justice Movement that Moved offline, New Media & Society, Vol. 14, No. 2, Pp. 225-243. Kobayashi, T. (2009). Bridging Social Capital in online Communities: Heterogeneity and Social Tolerance of online Game Players in Japan, Information and Society Research Division, National Institute of Informatics, Chiyoda-ku, Tokyo 101-843, Japan. Kushin, M. J. & Kitchener, K. (2009). Getting political on Social Network Sites: Exploring online Political Discourse on Facebook. First Monday, Vol. 14. Norris, P. (2001). Digital Divide? Civic Engagement, Information Poverty and the Internet in Democratic Societies. New York: Cambridge Univ. Press. Papacharissi, Z. & Mendelson, A. (2011). Toward a New(er) Sociability: Uses, Gratifications and Social Capital on Facebook, Media Perspectives for the 21st Century, Stelios Papathanassopoulos (Ed. ), Routledge. Papacharissi, Z. (2004). Democracy online: Civility, Politeness, and the Democratic potential of online Political Discussion groups. New Media & Society, Vol. 6, No. 2. Papacharissi, Z. (2009). The Virtual Geographies of Social Networks: A Comparative Analysis of Facebook, LinkedIn and ASmallWorld. New Media & Society, Vol. 11, No. 1‐2. Putnam, R. D. (1993). Making Democracy Work.Civic Traditions in Modern Italy, Princeton: Princeton University Press. Putnam, R. D. (1995). Bowling Alone: America's Declining Social Capital, Journal of Democracy, Vol. 6. Putnam, R.D. (2000). Bowling alone. the Collapse and Revival of American Community, New York: Simon and Schuster. Robteutscher, S. (2007). Social Capital and Civic Engagement: a Comparative perspective, New York: Oxford. Schneider, J. A. (2007). Connections and Disconnections Between Civic Engagement and Social Capital in Community-Based Nonprofits, Nonprofit and Voluntary Sector Quarterly, 36: 572 Originally published online 9 October 2007, DOI: 10.1177/0899764006297236. Stone, W. (2001). Measuring Social Capital, Sydney: Australian Institute of Family Studies. Tapia, H. & Ortiz, J. A. (2010). Network Hopes: Municipalities Deploying Wireless Internet to Increase Civic Engagement, Social Science Computer, 28: 93, DOI: 10.1177/0894439309335169. Tufekci, Z. (2008). Grooming, gossip, Facebook and Myspace: What can we Learn about these Sites from those who won’t Assimilate?. Information, Communication & Society, Vol. 11, Pp. 544–564. Valenzuela, S., et. al. (2009). Is There Social Capital in a Social Network Site? : Facebook Use and College Students’ Life Satisfaction, Trust, and Participation. Journal of Computer-Mediated Communication, 14. Vanhoutte, B. (2011). Social Capital and Well-Being in Belgium (Flanders), Identifying the Role of Networks and Context, PHD thesis. Verba, S.; Kay, L.S. & Henry, E. B. (1995). Voice and Equality: Civic Voluntarism in American Politics, Cambridge, Mass: Harvard University Press. Wagle, U.R. (2006). Political Participation and Civic Engagement in Kathmandu: An Empirical Analysis with Structural Equations, International Political Science Review, Vol. 27, No. 3. Wellman, B., et.al. (2001). Does the Internet Increase, Decrease, or Supplement Social Capital? : Social Networks, Participation, and Community Commitment. American Behavioral Scientist, 45, P. 436. Xiaoming, H. & Kay, C. S. (2004). Factors Affecting Internet Development: An Asian survey. First Monday, Vol. 9, No. 2.